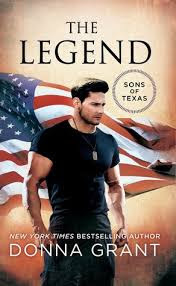 This is the third book in the Sons of Texas series and it mainly follows the story of Wyatt and Callie and I highly recommend that the series is read in order otherwise it does not make much sense. I am a huge fan of the series and have been following it from the first book and I absolutely love the way the book keeps you at the edge of your seat with all the action and suspense occurring, but at the same time it gives you all the thing that I love in a romance novel. Wyatt's character was this strong alpha male who protects those he loves even if it might put his life at risk and I loved that he also had a softer side for Callie ( even though we rarely got to see it ). I really enjoyed Callie's character because she was strong and independent and she stood her ground and fought when she was in danger, she did not just let Wyatt protect her like a damsel in distress. The chemistry between Wyatt and Callie was great and it was good to get their background story on their relationship in this book. Donna once again managed to keep the reader intrigued throughout the entire book through her flawless writing and brilliant characters. This by far one of the best series that I have read in a very long time and I loved seeing all the characters woven into all three books, however I would like to see another book in this series as I felt that this book was ended abruptly. A great read that has definitely made be a fan of Donna Grant. Callie Reed is and expert sharpshooter and hacker who does not need a man to protect herself, but when danger comes lurking in the form of a deadly group called The Saints, she is forced to join hands with the man who broke her heart many years ago. Wyatt Loughman is a stone hearted legend in the army who is a is part of the Delta Force. When his father is kidnapped he is forced to return to the home he never wanted to come back to and to the only girl he has loved whose heart he broke many years ago. As Callie and Wyatt spend time together trying to fight the bad guys, they realize that their attraction is still there. Will Wyatt be able to save Callie without putting her life in danger?